Under the major deal signed between Russia and Iran, another four units will be built on other sites. Analysts believe the deal will boost economic development in both countries. Russian state corporation Rosatom and Iran signed a contract for the construction of two more units at the Bushehr Nuclear Power Plant, as well as the construction of units at other sites in Iran. Experts already call it the biggest foreign project of the Russian state corporation. Its realization will boost the economic development of both countries. 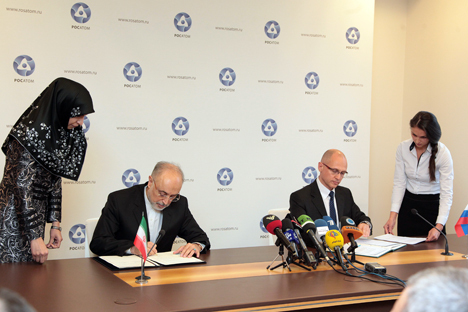 The contract includes the construction of two nuclear units of Bushehr NPP, to be possibly followed by another four. The parties also agreed to build another four units on other sites that have not yet been determined. The price of the contract hasn't been disclosed, but similar projects abroad were previously estimated at $10 billion. The entire project of constructing nuclear power units in Iran, including the supplies of equipment and nuclear fuel will be under the supervision of IAEA, and will fully comply with the commitment to non-proliferation of nuclear materials, just as it was during the construction of the first power unit of the Bushehr NPP, Rosatom said in a press note. Throughout the entire life cycle of eight new power units the nuclear fuel for the plant will be manufactured by the Russian side. The spent nuclear fuel will be returned to Russia for reprocessing and storage. As part of expanding the construction of Russian-designed nuclear power units in Iran, partners plan to look into the economic feasibility and the possibility to locally produce nuclear fuel elements that would be used in these power units. Iran, in turn, gets the possibility to diversify its energy policy. “Even before the Islamic Revolution, the development of nuclear power has been a priority matter. There was a proposal to build 20 nuclear units,” senior researcher at Russian Academy of Sciences’ Institute of Oriental Studies Vladimir Sazhin told Vzglyad. According to Sazhin, the growth of nuclear energy facilities would enable Iran to export more oil and gas, significantly increasing the country's incomes. Moreover, it would create the much needed jobs in Tehran.